The flowers of this perennial are so tiny that from a distance they appear to go from bud to seed head without having real blooms. Seen at close quarters, however, the flowers really are quite beautiful. Despite its appearance Hemp Agrimony is not an umbellifer but a member of the Daisyfamily. Plants grown to 1.5m, with reddish stems and palmate toothed leaves the 3 or 5 narrow segments of which are lanceolate. Upper leaves are undivided. The dioecious flowers, which are in small dense trusses of five or six florets, vary from very pale pink to deep mauve. Each corolla has five or six short pinkish teeth; the anthers are brown, while the style, which is remarkably long, is white. Hemp Agrimony is a very common plant and can be found throughout Britain and Ireland, except in the far north; it occurs also in most parts of Europe as well as northern Africa and parts of western Asia. This is an introduced species in other temperate regions including British Columbia, where it has become naturalised in the wild. 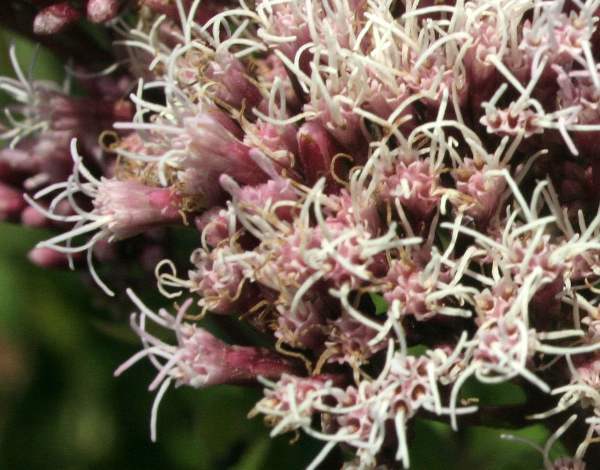 Hemp Agrimony favours damp alkaline soils and is most common in marshy places, canal and riverbanks and shady woodland edges. Strangely you will sometimes find it also on dry wasteland. 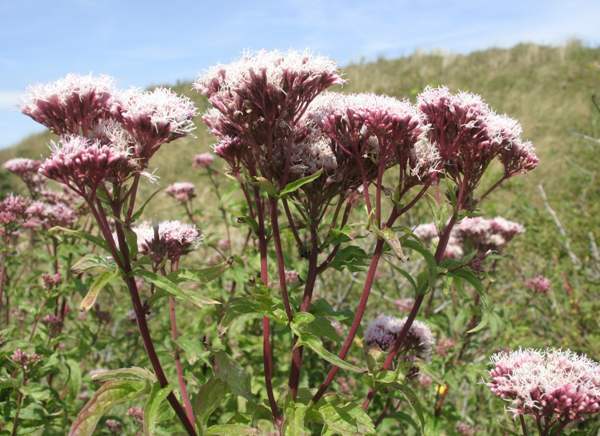 In Britain and Ireland Hemp Agrimony blooms from July through to September. Grown commercially for decorative use as cut flowers, Hemp Agrimony also plays another vital ecological role: it is greatly loved by butterflies - so much so that many gardeners plant it more for the colourful insects that it attracts than for its inherent ornamental value. Butterflies and moths are the main pollinators of Hemp Agrimony. The genus Eupatorium was named after Mithridates Eupator (134-63 BC), king of Pontus, who is reputed to have used a species from this group as an antidote to a poison in common use at that time. The specific epithet cannabinum means hemp-like and is a reference to the leaves which are similar to those of Hemp or Cannabis plants (for example Cannabis sativa) which have been used for making rope etc (and psychoactive substances!). The common name Hemp Agrimony reflects this feature too. In some parts of Britain this plant is well known by the common name Raspberries and Cream. 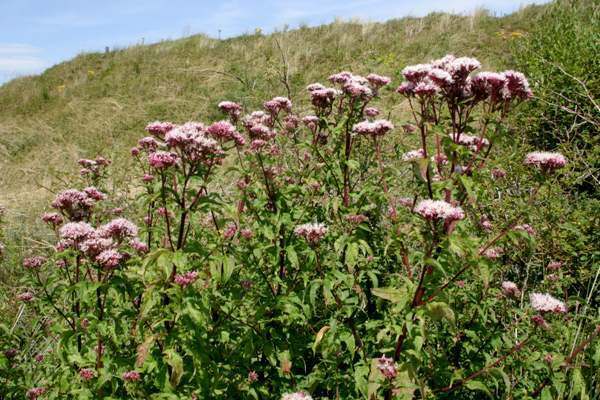 The pictures of Hemp Agrimony shown on this page were taken in South Wales during August.